Pond Air PRO Oxygen is essential to your pond’s health. Every process that happens in your pond depends on oxygen in some way. Sometimes, your pond’s oxygen levels may be lower than they should be. This is true particularly at night when plants are not converting carbon dioxide into oxygen and also generally speaking, dissolved oxygen levels are lower in warmer water temperatures. 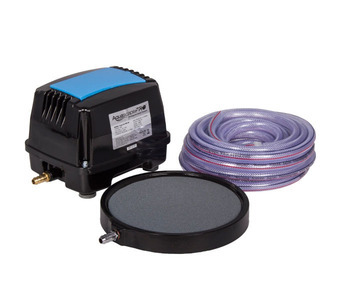 For these reasons, a pond aerator is an essential part of your pond care and maintenance system. It will help all biological processed and create a more stable pond environment, resulting in healthier fish and plants. Aquascape’s Pond Air Pro 60 is an ideal choice. It is energy-efficient, quiet and simple to use and maintain. Its durable outer housing prevents damage, ensuring years of trouble-free operation and it comes complete with a winter- resistant airline, preassembled check valves and weighted air stones. Plus it’s backed by Aquascape’s 3 year limited warranty. 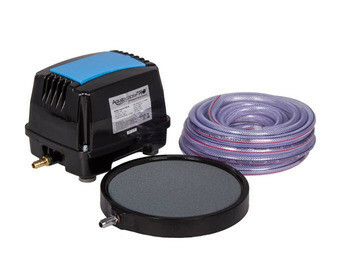 In order to ensure optimum performance, the Aquascape Pond Air Pro 60 pump should be placed in a dry indoor location, free from airborne dust and debris. Aeration is also very important during winter months in colder climates, as aeration helps to keep a small hole open in the surface of the pond to aid in degassing.